The UN declaration is an international high five to provinces like Saskatchewan where pulse crops are expected to hit 20 per cent of total seeded acreage in 2016, says Carl Potts, executive director of Saskatchewan Pulse Growers (SPG). Most of those 10 million acres will be seeded to varieties of dry peas and lentils developed with home-grown ingenuity that’s made Canada the world’s largest producer and exporter of those two commodities. Indeed, the country’s industry currently ships pulses, including chickpeas and dry beans, to more than 150 countries. Corey Loessin, an SPG board member since 2013, has been growing peas and lentils near Radisson, SK since 1991. Returns fluctuate with cash markets, but pulses are profitable, he says. He also likes what the crops do to improve soil tilth and nutrient levels on his farm. The pulse crop’s capacity to fix soil nitrogen and make it available to next year’s crop is just the start, says Neil Whatley, a crop specialist with Alberta Agriculture and Forestry (AAF). By extending rotations, pulse crops positively impact disease and weed pressures. Because pulses are more shallow-rooted than cereals and oilseeds, their root systems improve soil moisture penetration and the soil’s capacity to hold water. Pulses are also a good fit with conservation tillage practices. “The decomposing roots and nitrogen fixing nodules on the roots create a nitrogen flush for the next crop,” says Whatley. Loessin says those agronomic advantages save him money. Now growing green and yellow peas and red lentils, he does not add any supplemental nitrogen to fields with pulse crops. “We notice that wheat crops grown on pea stubble produce per cent higher in protein,” says Loessin. Looking ahead, Vandenberg says he foresees a time when farmers will think beyond four-year rotations. “What if you had two pulse crops and you grew them every eight years? You might have peas in year one and again in year nine, but faba beans in year four.” According to Vandenberg, this would provide all the benefits of including legumes in rotation while simultaneously reducing disease pressure and herbicide resistance. As for what it takes to grow pulse crops in Canada, there’s no question these crops demand different field strategies, says Whatley. Based in Stettler, AB, his office services a region of east-central Alberta where pulses, particularly lentils and peas, are rapidly gaining ground. Whatley says floating or flex headers are an industry staple for harvest and producers know they have to roll pulsecrop fields after seeding. The rolling pushes rocks into the soil, making harvest easier. 1. Lower input costs. 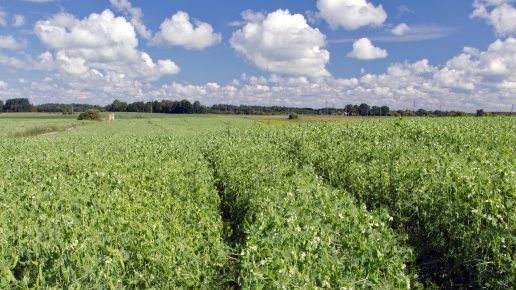 Pulses fix nitrogen and make it available to next year’s crop. Data from Alberta Agriculture and Forestry shows that nitrogen equals double-digit yield increases in canola, wheat and barley grown after a pulse crop. 2. Improved soil health. Adding pulses to a four-year crop rotation plan improves the water-holding capacity of soil. 3. Multiple markets. Pulse crops are sold into human, animal and ingredient markets — all of which are growing. These are the crops the world wants.